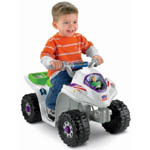 The Power Wheels Disney Toy Story 3 Lil’ Quad Ride On Toy by Fisher Price is one of the Best Ride On Toys for Toddlers age 12 to 36 months old. 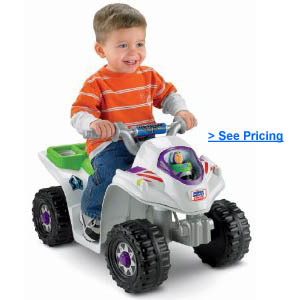 This battery operated “ATV for Toddlers” is fun and easy to ride. With a top speed of 2 mph, it’s fast enough to be exciting for young children, but not too fast. This toy is designed for outdoor use on a level and hard surface, but could also be a great indoor toy in any large open area or basement. If your child loves Buzz and Toy Story, then this is a great first powered ride on toy for toddlers. If you like this toy, you may also want to check out our list of the Best Ride On Toys for Toddlers.